The Mail that comes with Leopard has a feature called "Mail Activity". What is displayed in this is mail that is being sent or received. It is very useful to see when a large email with attachments is finally sent. You can also see mail arriving before it is even displayed in your inbox. To see the "Mail Activity" window, just click on the arrow in the lower left corner (2nd button from the left). By default, mailto links (websites that integrate a link to an email address) are loaded in Mail and it is not very useful if you only use webmail. In the Firefox preferences, you can change that to Gmail (website), Yahoo Mail (website), or another application. It is under "Applications" and the content type is "mailto". The default way iTunes displays the total time of a song or a playlist in the lower bar is approximate. You can toggle between the approximate and exact time by clicking on the time displayed. I nearly always use the keyboard shortcuts for taking screenshots, but occasionally when I need more features, I use the "Grab" application. I have just discovered, however, that Preview now has most of the features available in Grab. The Grab feature is under the File menu and includes "Selection", "Window" and "Timed Screen". A new Aperture plugin was just released by Pixelpipe and it lets you upload photos to many social networking websites, blogs, etc. Once you've downloaded the plugin, you have to create an account with Pixelpipe. It is a really great solution, because there are so many social networking websites now that it just takes too much time to upload photos separately to each website. You can download the new plugin here from MacUpdate. Supported services include: Picasa Web Albums, Flickr, Facebook, Friendfeed, Blogger, Wordpress, Twitter, Kodak, LiveJournal, Photobucket, SmugMug, Tumblr, Webshots…and many more! MacUpdate just added a bonus app to the bundle that ends in 2 days. It is the game "Pangea Arcade" (value of $19.95). Everyone who already purchased the bundle will get the serial number sent by email (can also be accessed through your web receipt). The bonus app is a limited time offer only available for the first 20 000 bundles sold. I talked about enabling the OS X firewall yesterday, but here is another feature to enhance security even further. In the firewall advanced preferences, you can enable the feature called "Enable Stealth Mode". This will ensure that traffic that you didn't allow won't receive a response, not even an acknowledgment. A great feature that is part of Numbers (included with iWork) is "Send to iWeb". It is a great way to publish Numbers documents to the web. The options include "PDF" or "Numbers Document". Of course, if the people you are sharing the document with don't have iWork, PDF is the best option. The "Send to iWeb" feature is located in the File menu. 1. Go to "Skype", "Preferences...". 2. Enable or disable "Show Address Book Contacts". Drive Genius 2 is part of the MacUpdate 10 applications bundle (you can get more info or buy the bundle here from MacUpdate). Drive Genius is a very complete disk optimizing application that has a lot more features than Disk Utility that comes with the OS. One of the features of Drive Genius is "Defrag". It is argued that it is not necessary on OS X, because the OS does it on the fly. The truth is that OS X defrags on the fly only for files smaller than 20 MB. I can really see this being useful for me as I work with huge files daily. Another interesting feature is "DriveSlim". It lets you find unwanted files to clear up space (temporary files, cache, PPC part of an app, duplicates, etc). Another feature that is much better in Drive Genius than in Disk Utility is "Partition". In Disk Utility, you actually have to erase the whole data before partitioning. In Drive Genius, you can partition a hard drive with data on it, on the fly. Drive Genius included with the bundle also comes with a downloadable disk image that you can burn to DVD and then use to boot right into the application without loading OS X. 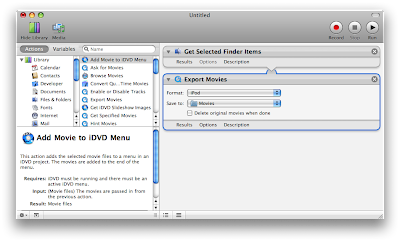 It can be a great option to erase the data on a Mac that has no more working installation of OS X. You can just boot into the application and use the "Shred" feature! You can get Drive Genius 2 in the MacUpdate bundle here. Default Folder X is part of the MacUpdate 10 applications bundle (you can get more info or buy the bundle here from MacUpdate). 1. Click on settings in the Default Folder X preferences. 2. Uncheck the checkbox next to "In the Dock" under the "Menus" tab. Overall, I think it is an amazing application that runs quietly in the background and that can make the process of opening or saving files much more efficient. Easily adding Spotlight comments will also enhance the quality of Spotlight results. You can get Default Folder X in the MacUpdate bundle here. MacPilot is part of the MacUpdate 10 applications bundle (you can get more info or buy the bundle here from MacUpdate). I have to admit, I didn't think MacPilot was going to be this great before I tried it. I thought it was going to be similar to OnyX which is free, but it is different in many ways. I haven't had time to go through every feature, because there is so much there. The feature "Mute startup chime" really stands out to me because I had many requests about how to do this and I didn't know how. 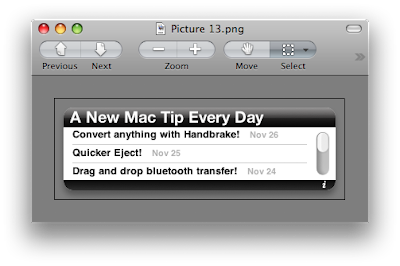 I'll try the other features and post more about MacPilot in the next few days. You can get MacPilot in the MacUpdate bundle here. There is a standalone Stickies application that comes with OS X and it is useful because it doesn't fill the Dashboard like the Stickies widget. All the stickies are displayed as soon as you load the app, so if you have too many stickies, it will fill your screen. To save space, you can collapse the stickies that you don't use often. To collapse the sticky, you just have to double-click on the top bar of the sticky or press "Command - M". 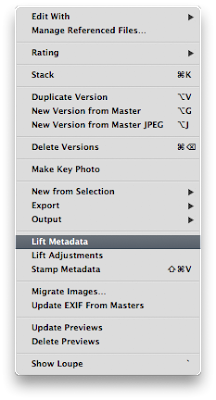 An easy way to batch apply keywords in Aperture is to use "Lift Metadata". To do so, you just have to set the keywords you want to batch apply to one picture, right-click on the picture, select "Lift Metadata", select the pictures you want to apply the keywords to and click on "Stamp Selected Images" in the "Lift & Stamp" window that just appeared. More and more images have transparency and it is not always obvious where the edge of the image is. When you are checking out an image in Preview, you can hold down "Ctrl" to show the edge of the image. A great feature in Address Book is that the date when the card was last updated is displayed in the lower right corner. It is very useful to eliminate duplicate cards as the card most recently updated should be the one with the latest info.